Rich land owner Frederick Hoffman (Sam Neill) loses his wife in a carriage accident in the woods, leaving him to raise their daughter Lilli on his own. Years later a teenage Lilli (Monica Keena) is troubled to see her father remarry to the mysterious Lady Claudia (Sigourney Weaver). Before long Claudia is revealed to have supernatural powers derived from a magical mirror in her chambers and, resenting Lilli’s emotional hold on her father, Claudia sends her running for life into the forest. 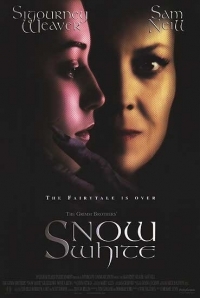 The Brothers Grimm’s popular fairy tale Snow White and the Seven Dwarfs gets a particularly dark and semi-realistic makeover in Michael Cohn’s 1997 film Snow White: A Tale of Terror. Produced with the intention of having a theatrical release, its distribution deal collapsed at short notice and it was instead relegated to cable television. It is a small scale but remarkably effective dark fantasy. The changes to the traditional story are what makes the film work so effectively. When Lilli runs into the forest, she soon finds herself not sheltered by singing dwarfs but kidnapped by a septet of starving miners. They resent her wealth and social standing, and debate the merits of either killing her or ransoming her back to her father. As time goes on they begin to reveal individual personalities and agendas and, as the film progresses, become friends. Of particular note among them is English actor Brian Glover: always underrated, his gruff voice and Sheffield accent made him a memorable addition to any film. This was his final on-screen performance; he died from a brain tumour shortly before Snow White premiered. The other major change to the story is in its ‘wicked witch’. Unlike previous iterations of the folk tale, which ascribed the witch’s motives to pure vanity, this Snow White gives her an unexpected element of self-doubt, personal tragedy and emotional complexity. It is clearly not Claudia that is evil but the mirror. It eggs her on, pushes her to murderous extremes, and progressively demolishes her sanity. ‘You have no heart!’ cries Lilli in one climactic scene. ‘That would be too easy,’ Claudia replies. Weaver’s performance is top-notch, free-wheeling between the sinister and the seductive, but always somehow finding a point of humanity at all times. It is an impressive and laudable achievement that went almost entirely unnoticed at the time. Without exaggerating, it is Weaver who makes the movie work. Monica Keena is admittedly a little ordinary as Lilli, but with so much of the film focused on Claudia there is an extent to which it’s the screenplay that fails Keena rather than the other way around. As her father Frederick, Sam Neill is a solid and reliable support for the central conflict. He is a perennially watchable actor, although in this film his accent does jar a little with everybody else’s. Snow White: A Tale of Terror is a modest film presented on a comparatively small scale, but it makes excellent use of its story and setting. It contributes something genuinely fresh to a very well-worn tale – and given the number of times Snow White has been revisited, that is no small feat at all.